We offer several different types of school and college visits to the University of Plymouth, for group sizes ranging from 30–150 post-16 students. 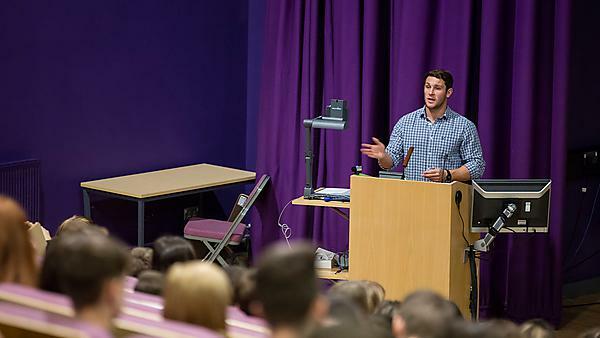 The range of talks we can present to the students include tackling UCAS and personal statements, how to choose the right course for them, as well as information about student finance, and more. All talks are given by an experienced member of our Schools and Colleges Engagement team. We also run visits to schools where we deliver various talks and workshops that are beneficial to students thinking about university. Before your visit we will discuss which of these talks you think would be most beneficial for your students and tailor the itinerary as appropriate. All content will also be tailored to your students’ current stage of learning. We typically receive visits from a number of schools and colleges across the South West. But we've also received visitors from further afield, and arrangements can be made if you are travelling a long way. The aim of our campus visits are to show your students first-hand what a typical university campus is like and to inspire your students to think about university study whilst experiencing campus life. The day consists of a number of elements to provide as much information as possible to your students, visits include a range of talks and a campus tour with one of our current student ambassadors so your students can gain a further understanding of what a campus university looks like. We also give the students an opportunity to have a question and answer session with a member of the Schools and Colleges Engagement team and current students to answer any questions about university life, the application process and also any questions that they day will have brought up. Please see below a typical itinerary for our standard campus visit. As mentioned, the visit content is flexible – the timings and presentations delivered can be adapted to suit your students’ needs. For some students, making an application to universities can seem like a daunting and complicated task. We aim to help ease the UCAS application process for your students and encourage those who find it hard to make the most of their talent. As an institution that receives thousands of applications each year, we're able to pass on our knowledge and advice to help prospective students put together a successful application. Our workshops consist of a presentation and interactive exercises to help understand the process, highlight important dates, and help students to start, construct and improve their personal statement. We also provide time to allow your students to go in to one of our on campus computer suites to start researching and writing their personal statements. This day is beneficial to students in the final stages of their first year at sixth form or college. It's also useful for students at the start of their second year at sixth form or college. Below is a typical itinerary for our UCAS and personal statement workshop. This itinerary is flexible and timings can be amended to suit your needs. These visits are run over the course of the academic year, with the exception of holidays and other busy periods, but are subject to room availability. To ensure that your students have access to University computer suites, we host our UCAS application workshops after our current students at Plymouth have completed their studies for exams and end-of-year deadlines. These workshops are available between May and July and early September. To enquire about arranging a visit, please contact us at outreach@plymouth.ac.uk. We regret that due to time constraints and demand, we’re only able to accept a very limited number of visits from Year 11 groups, during January only.